Wellness tourism – now worth a staggering $639bn globally according to the Association of Travel Agent’s 2019 Travel Trends report – seeks to relax the mind, body and soul through physical and mentally cleansing activities and the Can Lluc Agrotourism Hotel provides a combination of tranquillity, luxurious facilities and Ibizan tradition for the ultimate rejuvenating break. The property has for some time played a vital role in pioneering the wellness offering on the island. The first of its kind on the white isle, the property combines a modern architectural style with traditional touches of stone walls and juniper wood rooftops, to preserve the Iberian ambiance of the renovated 200-year-old farmhouse. Travellers in search of an alternative back-to-nature escape, Can Lluc offers guests a luxurious sanctuary from which to explore the great outdoors, breathing in the fresh country air and indulging in some much needed ‘me-time’ – a natural remedy to recharge the batteries. 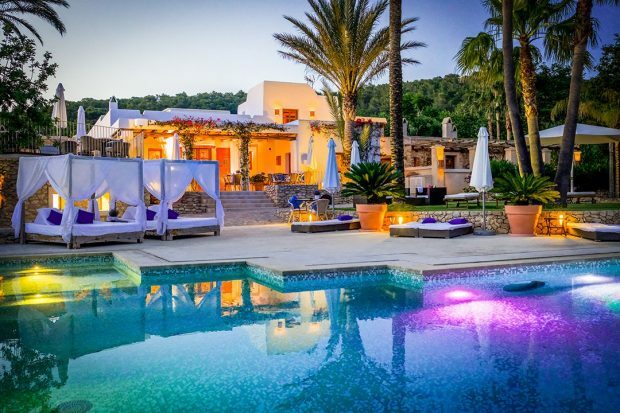 The Can Lluc Agroturism Hotel is the perfect combination of Ibiza’s eclectic vibe and its inland beauty, using its picturesque surroundings to enhance its wellness offering. The gardens across the property offer a tropical outdoor area where guests can take part in guided Yoga sessions, with the Ibiza hills and Olive trees serving as the picture-perfect backdrop for the ultimate calming environment. Alternatively, for those wanting to lower the tempo Can Lluc’s hillside patios provide the ultimate ‘chill-out area’, with minimalist terracotta and white décor, comfy Balinese beds and relaxing ambient music, it’s the perfect place to enjoy a freshly prepared healthy snack including salads and energising smoothie’s post-workout. Massages are available in the ‘Zen Area’, an open-air wellness centre providing guests tailor made treatments to heal individual ailments through body treatments, hot stone massages and soothing aromatherapy massages with essential oils to engage all the senses. Favoured on the island for its culinary offering, the Agroturism hotel boasts one of the most unique gastronomic offerings on the island with the Olea Restaurant, incorporating its wellness and sustainable ethos into the menu. The gourmet restaurant is a blend of Mediterranean cuisine with Ibizan flare, using only fresh natural products sourced locally from surrounding areas. The restaurants open-air terrace provides panoramic views of the Ibizan countryside and the century-old farmhouse, providing a relaxing atmosphere to enjoy light Iberian delicacies. Ibizan wines from the neighbouring vineyards are a staple of the night, adding a local touch to the nutritious dishes. With just 20 charming rooms and just 10 km from the cosmopolitan heart of the city, the property provides tranquillity and privacy while providing access to the famed Ibizan culture, including local markets, quaint neighbouring towns and smaller pristine beaches. Can Lluc Agroturism Hotel offer rooms from rooms from £188 per night on a bed and breakfast basis.